This artist's illustration shows the Kepler planet-hunting telescope as it jettisons its dust cover, to open its sensitive camera eye on the cosmos. The hunt ison. The Kepler spacecraft opened to the universe this week and is getting setto search for Earth-size planets around distant stars. Perhaps we?ll find ahome for E.T. I?m simply thrilled that this critical next step went off withouta hitch. On Tuesdayevening, the Keplerspacecraft blew its lid. Well, actually it was a lot calmer than that; thecover was ejected in a carefully engineering maneuver. At 7:13:36PM, engineers at Kepler's mission operations center at the Laboratory forAtmospheric and Space Physics (LASP), Boulder, Colo., sent commands to pass anelectrical current through a "burn wire" to break the wire andrelease a latch holding the cover closed. The spring-loaded coverswung open on a fly-away hinge, and then drifted away from the spacecraft. Thetelescope's oval-shaped dust cover, measuring 1.7 meters by 1.3 meters (67inches by 52 inches), protected the photometer from contamination before andafter launch. The dust cover also blocked stray light from entering thetelescope during launch -v light that could have damaged its sensitivedetectors. In addition, the cover was important for calibrating the photometer.Images taken in the dark helped characterize noise coming from the instrument'selectronics, and this noise will later be removed from the actual science data. "Thecover released and flew away exactly as we designed it to do," said KeplerProject Manager James Fanson of NASA's Jet Propulsion Laboratory, Pasadena,Calif. "This is a critical step toward answering a question that has comedown to us across 100 generations of human history - arethere other planets like Earth, or are we alone in the galaxy?" "Nowthe photometer can see the stars and will soon start the task of detecting theplanets," said Kepler's Science Principal Investigator William Borucki atNASA's Ames Research Center, Moffett Field, Calif. "We have thoroughlymeasured the background noise so that our photometer can detect minute changesin a star's brightness caused by planets." DeputyPrincipal Investigator, Dr. David Koch, watched the cover ejection from NASAAmes Research Center, celebrating with the Kepler Science Operations Centerteam. ?Besideslaunch, this was the most critical event for the Kepler spacecraft, andeverything went as expected,? he said. ?The spacecraft settled after theejection, and the star trackers were rock solid. The first images have beentaken, and we look forward to reviewing those shortly. It was a truly excitingevent.? With thecover off, starlight is entering the photometer and being imaged onto its focalplane. Engineers will continue calibrating the instrument using images of starsfor another several weeks, after which science observations will begin. As a memberof the Kepler team, I?m thrilled that the next major milestone has beenachieved. The month following launch was devoted to spacecraft commissioning.The engineering team spent the time testing the onboard systems to assure allthat the spacecraft was working correctly. The ejection of the cover marks thebeginning of astronomical observations, the beginning of the search forEarth-like planets around distant stars. We?re on the eve of discovery, and I?meagerly awaiting the dawn. 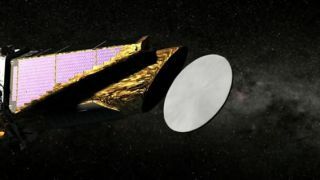 Kepler is aNASA Discovery mission. NASA's Ames Research Center Ames is the homeorganization of the science principal investigator, and is responsible for theground system development, mission operations and science data analysis. NASA'sJet Propulsion Laboratory, Pasadena, Calif., manages the Kepler missiondevelopment. Ball Aerospace & Technologies Corp., Boulder, Colo., isresponsible for developing the Kepler flight system and supporting missionoperations. Laboratory for Atmospheric and Space Physics, University ofColorado at Boulder, is home to the mission operations center. The SETIInstitute and Lawrence Hall of Science are responsible for Kepler Missioneducation and public outreach. Scientistsand engineers from about 30 universities, NASA centers and non-profitorganizations are Co-investigators and/or members of the science working groupin support of the Kepler Mission.